The loquat is comparable to the apple in many aspects, with a high sugar, acid and pectin content. It is eaten as a fresh fruit and mixes well with other fruits in fruit salads or fruit cups. Firm, slightly immature fruits are best for making pies or tarts. The fruits are also commonly used to make jam, jelly, and chutney, and are delicious poached in light syrup. A type of loquat syrup is used in Chinese medicine for soothing the throat like a cough drop. It is also used as an expectorant and to sooth the digestive and respiratory systems. Loquats can also be used to make wine. Loquat fruits grow in clusters and are oval, 3-5 cm long, with a downy yellow or orange skin. The succulent, tangy flesh is yellowish and sweet to subacid. The skin, though thin and edible, can be peeled off manually if required when the fruit is ripe. The plant is an evergreen large shrub or small tree, with a rounded crown, short trunk and woolly new twigs. It can grow to 5-10 m tall, but is often smaller, about 3-4 m. The leaves are alternate, simple, 10-25 cm long, dark green, tough and leathery in texture, with a serrated margin, and densely velvety-hairy below with thick yellow-brown pubescence; the young leaves are also densely pubescent above, but this soon rubs off. 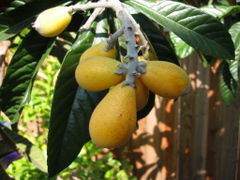 Loquats are unusual among fruit trees in that the flowers appear in autumn or early winter, and the fruits are ripe in late winter or early spring. The flowers are 2 cm diameter, white, with five petals, and produced in stiff panicles of three to ten flowers. Full sun or part shade. Grows well throughout Australia. Can attract fruit fly - bag the fruit or hang traps of vegemite water.